The Sunday Express have published a glowing endorsement of UKIP and Nigel Farage ahead of the elections. On Thursday, Britain will vote in the closest General Election for a generation. The days when our collective fates were parcelled up between the old order of Conservative and Labour are gone. They will never return, for the ground has irrevocably shifted. No party has done more to churn the landscape of British politics than Ukip. Once it seemed that the faint whispers of this grassroots movement would remain forever relegated to the fringes of society. If they were heard at all they were dismissed by a high-handed establishment, being branded “fruitcakes” and “clowns”. Yet the Ukip message resonated with too many voters to be ignored. Suddenly, the name-calling stopped. Ukip has forced the Tories to become more Conservative. It also stands for the working class who do not wish to be represented by career politicians of Ed Miliband’s ilk. In some quarters it has already been labelled “the new Labour Party”. To understand its broad appeal simply consider its commonsense messages. 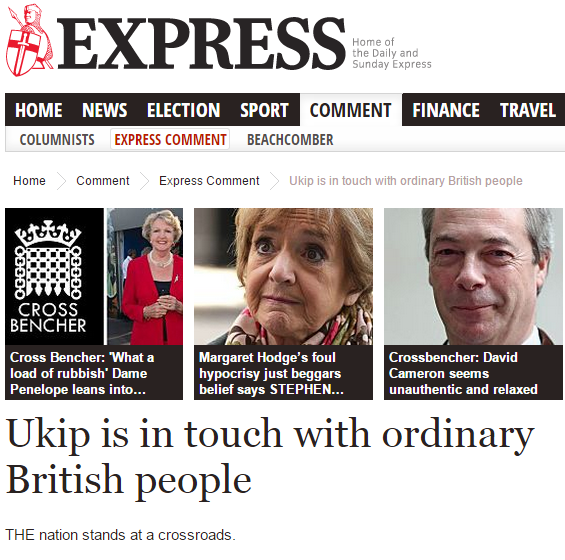 Check out the full article to see why the Express is backing UKIP.